Included is the Ideal Nikon Digital Camera Accessories KIT for Nikon Coolpix AW130, AW120, AW110, AW100, C810, S9900, S7000, S6900, S3700, S2900, S33, S32, S9700, S9500, S80, S60, S220, S210, S205, S200, S700, S600, S750, S520, S510, S500, S9300, S9100, S8200, S8100, S8000, S9300, S9100, S8200, S8100, S8000 S3600, S3500, S3300, S3200, S3100, S3000, S4300, S4200, S4100, S4000, S80, S60, S220 Digital and All Nikon Digital Cameras. The Kit Includes a Includes a 32GB HighSpeed SD Memory Card + a Memory Card Wallet Case Holder for keeping Memory Cards separately making it convenient to carry and identify each card individually. In Addition the Accessory Kit Includes ta Full Size Pro grade 60″ inch Tripod with 3Way PanHead, Bubble level indicator, 3 Section aluminum alloy lock in legs, plus a Full Size 72″ Inch Monopod with 4 Extendable Sections, folding into a compact 21.5 inch making it a convenient item to carry and travel with. Both the Tripod and Monopod include a lightweight Carrying Bag. 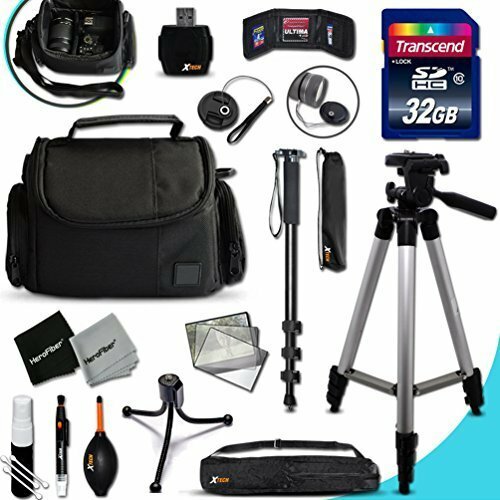 Additionally included in the Kit is a Well Padded DSLR Camera Case, that with it’s Zippered Pockets and customized interior is designed to fit a Camera with Lenses and other commonly used accessories. Case Dimensions: 12 ½” Width x 6 ½” Depth x 7 ¼” Height. + Memory Card Wallet Case Holder + 52mm Center Pinch Lens Cap + Lens Cap Holder + 2 Screen Protectors + Universal Memory Card Reader + Cleaning Dust Blower + Cleaning Pen + Mini Flexible Table Tripod + Deluxe Cleaning Kit and a HeroFiber® Ultra gentle cleaning cloth designed for cleaning electronics and accessories. Includes the Ideal Nikon Digital Camera Accessories KIT for Nikon Coolpix AW130, AW120, AW110, AW100, C810, S9900, S7000, S6900, S3700, S2900, S33, S32, S9700, S9500, S80, S60, S220, S210, S205, S200, S700, S600, S750, S520, S510, S500, S9300, S9100, S8200, S8100, S8000, S9300, S9100, S8200, S8100, S8000 S3600, S3500, S3300, S3200, S3100, S3000, S4300, S4200, S4100, S4000, S80, S60, S220 Digital and All Nikon Digital Cameras. Includes a 32GB HighSpeed SD Memory Card + a Memory Card Wallet Case Holder for keeping Memory Cards separately making it convenient to carry and identify each card individually. Includes a Full Size Pro grade 60″ inch Tripod with 3Way PanHead, Bubble level indicator, 3 Section aluminum alloy lock in legs, plus a Full Size 72″ Inch Monopod with 4 Extendable Sections, folding into a compact 21.5 inch making it a convenient item to carry and travel with. Both the Tripod and Monopod include a lightweight Carrying Bag. Includes a Well Padded DSLR Camera Case, that with it’s Zippered Pockets and customized interior is designed to fit a Camera with Lenses and other commonly used accessories. Case Dimensions: 12 ½” Width x 6 ½” Depth x 7 ¼” Height. Includes a Memory Card Wallet Case Holder + 52mm Center Pinch Lens Cap + Lens Cap Holder + 2 Screen Protectors + Universal Memory Card Reader + Cleaning Dust Blower + Cleaning Pen + Mini Flexible Table Tripod + Deluxe Cleaning Kit and a HeroFiber® Ultra gentle cleaning cloth designed for cleaning electronics and accessories.